A book about the most misunderstood part of the guitar: STRINGS! Natural Frequency - The frequency or frequencies at which a string tends to vibrate when it is hit, struck, plucked, strummed or is somehow disturbed physically. String Timbre - The quality of sound given off by a vibrating object such as a string. Slip-Stick Friction - This is the friction cause by a bow being dragged across a string. This friction makes the string vibrate and give off a tone. Forced Vibration - This occurs when a string begins to vibrate, thus forcing another connected connected body (i.e. guitar's sound board) into a vibrational motion. String Resonance - A phenomenon that occurs when sound wave energy of similar frequency transfers to a string, and causes that string to vibrate into motion. String Harmonics - Nodes created by standing waves within a string's vibrational pattern. Fulcrum - A support or point of support on which a string vibrates. This is typically on the bridge saddle or nut region. String Wave Formula - This is an equation that can be used to predict the natural frequencies produced by a known length of string. The calculation requires a knowledge of the speed of a wave in a string. Anti-Harmonic - A point in between two harmonic nodes that has the greatest amount of vibrational movement. Sometimes also referred to as an anti-node. Standing Wave Pattern - A string's a vibrational pattern is created when the vibrational frequency of a source causes reflected waves from one end of the string to interfere with incident waves from the source in such a manner that specific points along the string appear to be standing still like nodes. Breaking Frequency - If you were to take a string and progressively stretch it between two fixed nodes it would continue to increase in frequency. At some point, and frequency, the string would break. This is known as the breaking frequency. Tinned Mandolin Wire - This is the type of wire used to make steel instrument strings. Mandolin wire is made from high carbon steel bar stock that is extruded until the desired thickness (gauge) is achieved. The steel bars are basically extruded into wire strings. Once the string has been extruded, it is electroplated with tin. The ten helps prevent the string from corroding prematurely. Wrapped String - In an effort to give a string more mass, without increasing it's stiffness, string makers began winding two strings together. The winding pattern consisted of a straight core wire with an outer string coiled (or wound) around it. This outer winding enabled a string to reach lower frequencies. Today, wrapped strings are the main part of a guitar's string set. Wound String - See Wrapped String. Overspun String - See Wrapped String. Core - The inner string of a wrapped string. Core-to-Wrap Ratio - The relationship between the size of the core and the wrap wire on a string. Hex Core - This is a core string that is hexagonal in shape with respect to it's cross section. Round Core - This is a core string that is round in shape with respect to it's cross section. Plain String - These are strings that have no outer wrap on winding. They are the raw tin coated mandolin wire strings. Gauge - The outside diameter of a string often measured in the thousandths of an inch. Round Wound - A wrapped string with a winding wire that is round in it's cross section profile. This type of string is very bright and clean in it's tone. Flat Wound - A wrapped string with a winding wire that is rectangular or square in it's cross section profile. This type of string gets a very softened tone. Ribbon Wound - See Flat Wound. Semi-Round Wound - A wrapped string with a winding that has a semi-circle shape in it's cross section profile. This type of string exhibits a tone that is a mix between a round wound string and a flat wound string. The result is a softer and mellow sounding round wound string. The surface of these strings is much smoother, and gives less finger squeak. Ground Wound - This is another term used for a semi-round wound string. It is a bit more descriptive as it describes the winding being ground to flatten the outside surface. Ground Round - See Ground Wound. Ball - A small cylindrical metal barrel found at the end of a metal string. The barrel typically has a groove around it for the string to seat and stay attached. Most bridges rely on the ball as an anchor point for the string. Ball End - Strings that have a ball on the end. See Ball. Silk Wrap - Some strings will have an additional winding of silk around them at the trim end. This is often referred as a silk wrap. The purpose of this wrap is two fold. One is to help secure the primary metal wrap in place until the string is installed. The second is purely cosmetic. Finger Squeak - This is a noise caused when you rub the surface of a round wound string. It is commonly heard as players are shifting fret positions up and down the neck with wound strings. It is caused by the friction generated between the finger and the string wrapping. This friction is sometime referred as "slip-stick friction". String Winder - A small time saving devise used to crank a tuning peg. The string winder helps speed up string installation. String Pickup - An electromagnetic device or piezoelectric device used on guitars and basses. Electric guitars use variable reluctance sensing (VRS) to electromagnetically detect string vibration. Acoustic guitars typically use piezoelectric transducers to detect string vibration. Cryogenic String - These are strings that have been frozen to liquid nitrogen temperatures and brought back to room temperature. The cryogenic process is used to extend string life. Coated Strings - Strings that have a thin outer coating of polymer resin. The bronze wound strings typically have this coating to reduce corrosion. Cat Gut Strings - Strings made from intestinal parts from livestock such as lamb or bull. Organic Strings - A more recent alternative name for Cat Gut strings. Advanced String Intonation (ASI) - Intonation variables that are not solely related to nut and saddle positions. Green Strings - Strings that are made with the planet's environment in mind. They often use recycled alloy, biodegradable packaging, and conform to the "green movement" of society. Bulk Strings - These are strings that are packaged and sold in bundles without individual packages or envelopes. Big Boy - A term used in reference to the thickest string on an instrument. Chubby Wire - A heavy gauge set of strings. String Fart - A string breaking while playing. Castrated - See String Fart. Lucky Wire - A string that breaks while the instrument is not being played. Ball Buster - A bridge that requires the ball-end to be cut off for installation. String Vasectomy - See Ball Buster. Bent Skinny - A plain wound string that has a bent kink in it. String Dandruff - Polymer particals left from a worn out poly coated string. Fret Robbers - Strings that cause extensive fret wear. Sore Neck - A guitar neck that needs refreted due to excessive string wear over time. Pubic Strings - Excess string (more than one) that has not been cut off of the headstock machines. Pubic Hair - See Pubic Strings. Puby - A string having excess string that has not been cut off the headstock machine. Connecting Rod - A string peg. T-Boned - When a string breaks during a guitarist solo. #@%&! - An expression used by guitarists when they get T-Boned. See T-Boned. Zipper - Running the edge of a pick down a wound string. Barn Door - See Zipper. Old Smokies - An old set of strings. Pennies - A bronze string set. Skinnies - Plain steel strings. Hot Metal - Ferrous strings. Fishin' Lines - Nylon strings. Silkies - Silk core strings. Loosie - An individually packed string not part of a string set. If you have a "String Slang" term not found in the Professor's glossary, let us know. 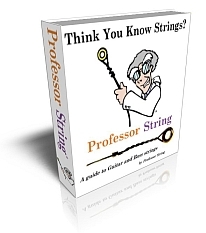 Your term could get published on the Professor String website with your name, alias, or band name.